Choose from executive, L-shaped, U-shaped, sit/stand, and modular office desks. Take a seat in our office chairs, available in all shapes, sizes, styles, and materials. Create the perfect meeting area with our wide selection of conference tables. Build a great team workspace with shared desks, workstations, and cubicles. Filing cabinets and other storage units keep your office organized and productive. Reception desks and furniture that create a welcoming environment for guests. Outlet furniture. Furniture for a great price! 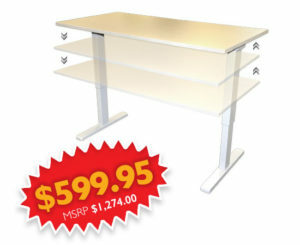 Custom laminate home office furniture with a budget in mind. The configurations are endless. Choose from 30 different finishes, all made quickly just for you. You won't hear can't do from Podany's. Some office configurations and needs require custom sizes. Don't let the word Custom scare you, it's not expensive. Our trained sales staff can help design furniture around your specific needs. Wether it is for 100 employees or simply a home office we can design it to be your furniture.